Adimab, the yeast-based antibody discovery play, will announce this morning that it added two new collaborations to the Merck and Roche deals it announced over the summer. And Tillman Gerngross, Adimab's co-founder and CEO, tells us the company plans to do "two deals per quarter with top fifteen pharma companies for the foreseeable future." But we're getting ahead of ourselves. For now, the biotech will identify fully human antibodies against an undisclosed CNS target selected by Pfizer and against an undisclosed oncology target selected by a separate, unnamed partner. As with Adimab's previous deals, neither partner gets exclusive rights to that target--the biotech can do another deal with another company around whatever target it chooses. The new collaborations appear identically structured if a little slim on financial detail: Adimab's partners get all rights to the antibodies the biotech delivers, in exchange for an upfront payment, preclinical and clinical milestones, commercial milestones, licensing fees and royalties on any therapeutic and diagnostic product sales. Also today, Adimab reports that it has received milestone payments from Merck and Roche based on delivery--within eight weeks--of the antibodies specified in their original respective deals. It's this kind of disclosure that Adimab thinks will raise eyebrows at other companies looking to augment their biologics engines. It's no coincidence that most of Adimab's deals are around single targets. The company does have customers and potential partners saying 'we want broad access', says Gerngross, "but they need to see exactly what they're buying before we can have a meaningful discussion," he says. "These deals are geared toward informing and educating our customers" about what Adimab's technology can do: better yields, broader epitope coverage, faster delivery, etc., he says. Sooner or later the companies that came in early "are probably going to start expanding their deals," he says, without saying what that broader access might look like. In any case, "currently we're resisting it. We don't want [any one company] occupying too much bandwidth." This always-leave-'em-wanting-more approach sets the stage nicely for future M&A (a la GlycoFi), though Gerngross won't be drawn into that discussion. Instead he says that he's trying to build a cash flow positive, revenue generating biotech company. And as we've pointed out before, Adimab wants to do this while remaining focused on discovery and avoiding development projects of its own. Apparently, it's nearly there. Gerngross says there's a "good chance" the company will be profitable in the first quarter of 2010, and perhaps for the whole year. It has no plans to raise money, having recently tapped new investor Google Ventures and its existing backers Polaris, SV, Orbimed and Borealis in a Series D. Furthermore it "discourages" partners from taking an equity stake in the company as part of any discovery deal. Surely any biotech could use a little extra cash cushion, though. "Looking at our net burn and cash in hand we have ten years of runway," says Gerngross. Ten years? "Yes. It's an unusual situation." 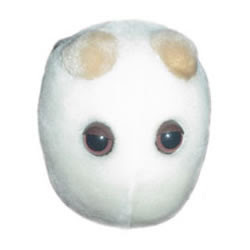 buy one of those fuzzy yeast toys here. Stealth Comparative Effectiveness in U.S.